I'm not a slob. Really. I'm just juggling the pressures of getting back to school and meeting article and project deadlines. 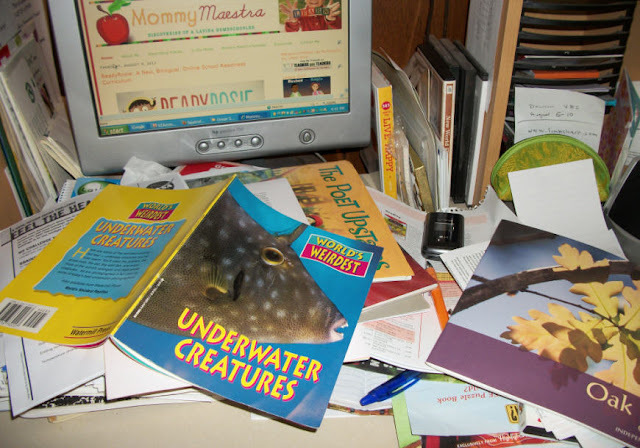 So don't touch my desk, even if it looks like a library/bookstore/papermill just threw up all over it. I know where everything is (sort of). I feel guilty for saying I need a break when we just had summer vacation, but the reality is that when you homeschool and work from home, summer vacation can be a joke. Hope to be back soon with more useful information.